Rosanna Davison went to the Spinal Injuries Ireland annual spring lunch last Saturday. It was an event very close to the former Miss World's heart. And to her mother Diane's, who accompanied Rosanna to the admittedly swish do at the InterContinental hotel in Ballsbridge. "Since breaking her neck in a horse-riding accident in the 1990s," Rosie told me, "my mum has been a patron of the charity; and it's an important one for our family." Does Diane still ride horses? "She has been up on a horse once since but that's it." And Rosanna? "I had horses throughout my teens," she answered, "but I haven't been up on a horse in years." I asked Rosanna was that because of her mother's accident. "No. I just haven't got back into it. But I hope at some stage in the future to own a horse again." It is no shock that Rosie would have zero equine fears, not least because she is something of a fearless young woman. A look at what she has been watching on Netflix should convince you of that. "Wes and I have watched The Haunting of Hill House; You; Dirty John: The Dirty Truth; Conversations with a Killer: The Ted Bundy Tapes; Abducted in Plain Sight. All the creepy thrillers and horrifying true crime docs!" What draws Rosie and her other half to this kind of heart rate-raising entertainment? "No idea! Perhaps it's the adrenaline rush of getting a fright." The general manager of the InterContinental Nicky Logue, nor his team, would not have gotten a fright last weekend, however, when Irish pop star Shane Filan checked in with his wife Gillian and their kids. They stayed last Saturday and Sunday nights. Westlife are regulars in the Dublin bling bolt-hole, which recently relaunched Dublin's largest 5-star hotel suite, the magnificently refurbished and renamed James Joyce Suite. Westlife guru Louis Walsh is another regular, and was in for a coffee last Tuesday. Almost as famous as Louis, Gay Byrne and Marty Whelan were in the InterContinental the week before on Thursday morning for a cup of tea together and a chat. Us mere mortals can but imagine what the greats of Irish entertainment - past and present - chat about when they get together over china tea cups in fancy hotels. I will dress up as a waiter (or a waitress) the next time and tell you all. There was a right Kerry-on in Ballymacelligott last weekend. Former Rose of Tralee Brenda Hyland was host to some of the Kingdom's most stylish ladies for the fashion show in support of Kerry Hospice Foundation and Rosabel's Room at O'Riada's Bar and Restaurant. Accompanied by a certain Sharon Shannon, Noel Heaslip serenaded Brenda with his version of Rose of Tralee. I'm told his late father Liam Heaslip serenaded her when she won the crown in 1983. Also in attendance were singers Eleanor Shanley, Corina K and Mayor of Kerry, Norma Foley. Sharon Shannon headed west in time to mark her father IJ's 91st birthday with a trad music session in the Pier Head, Kinvara with her siblings Garry, Majella and Mary, along with grand-kids and great friend Ted Quinn. Next stop for Rosabel's Rooms is Aqua Restaurant on Howth Pier on May 3. Sile Seoige will host Rosabel's second anniversary fundraising dinner. All 600 tickets are sold. I nearly choked on my delish hipster burger when I heard the news. Your diarist was in his new favourite haunt, fab Farmer Browns in Kilternan, on Tuesday evening; while six miles south in Glasthule one of the world's most beautiful, and supremely talented, actresses was having dinner in Rasam. Eva Green - for it was she - was dining with her pal Orla Carroll. Sans me! Staying for two hours, they had a lamb dish and veg curry, plus a bottle of Scala Dei Garnatxa. Eva, who was in Rasam last year with her mother, Marlene Jobert, comes in whenever she is in Dublin. Long may she. The Gallic goddess was more than compelling opposite our own Colin Farrell in Dumbo as gravity-defying circus high-flier Colette Marchant, to say nothing of being hauntingly sublime as the Queen of Jerusalem in Ridley Scott's opus Kingdom of Heaven, or just plain inspired in her debut in Bernardo Bertolucci's The Dreamers. So it is not hyperbole to suggest she lit up Rasam. And possibly the Rasam proprietor Nisheeth Tak too. Eva asked him for holiday tips before jetting off to India back in 2015. 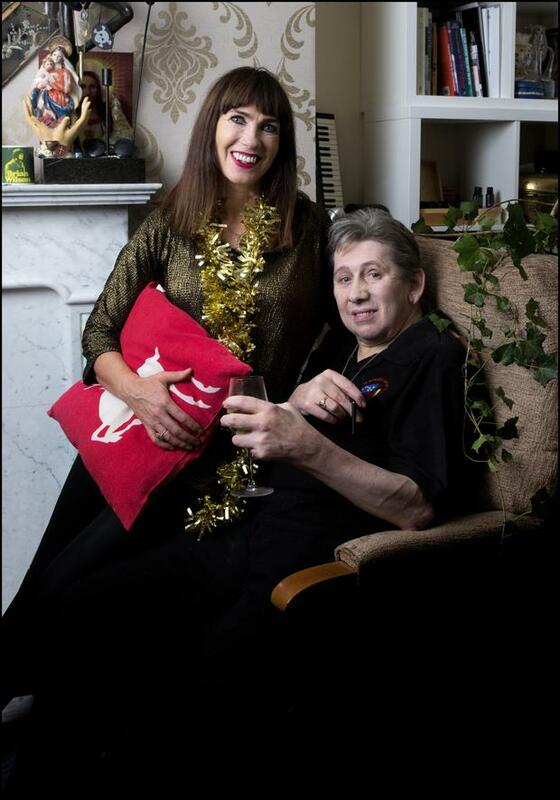 There will be an Easter Rising in the Dublin 4 home of Shane MacGowan and long-term muse Victoria Mary Clarke. This will take the form of the rising notes of the one-time frontman of The Pogues serenading his dear wife. "He often does sing to me," Victoria qualified. "When he is in a good mood." At the risk of changing her good mood, I asked since marrying Shane, has she changed her name to Victoria Mary MacGowan? "No! I will always be Clarke. He can be Shane Clarke!" Shane Clarke and Victoria are "not going away for Easter. We have no plans to do anything, except maybe eat Easter eggs!" she said, explaining that they would be from The Proper Chocolate Company. "They have vegan Easter eggs in the Good Food Store. They're amazing." "I might also have Marina Guinness over to play backgammon. Marina has been my friend for 25 years. She is wonderful. I might also plant some vegetables. It's so glamorous," she said, adding that she is MC-ing the Hope charity lunch and auction on May 17 at the InterContinental hotel in Dublin. "Shane and Johnny Depp are donating to the auction. And Dana is taking someone to dinner as a prize. I've been in a TV series with Dana," she told me. Why not a backgammon show on the telly with Marina?